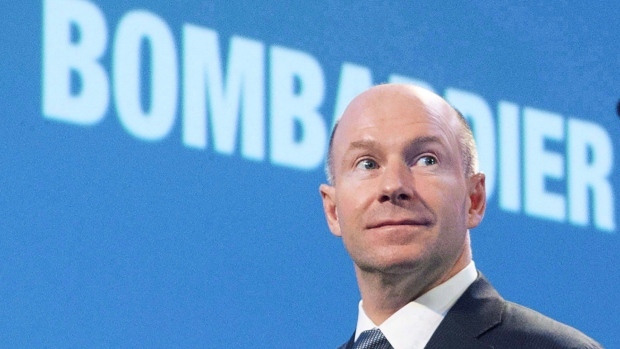 MONTREAL - Total compensation for Bombardier's (BBDb.TO) top five executives fell four per cent last year to US$29.5 million, according to a proxy circular released ahead of the company's May 2 annual meeting. CEO Alain Bellemare's total pay remained unchanged at US$10.63 million. He earned a salary of US$1.1 million and received a cash bonus of US$2.8 million, down from US$3.2 million in 2017. Share-based and option-based awards each rose by US$704,700 or 34 per cent, to US$2.78 million. Other compensation decreased by about US$1 million. Three of the four other senior executives saw their total compensation increase slightly, while former transportation president Laurent Troger's compensation decreased 30 per cent to US$3.6 million with the elimination of a US$1.5-million bonus paid in 2017.